Description: Ishak Pasha Palace (Turkish: İshak Paşa Sarayı) is a semi-ruined palace and administrative complex located in the Doğubeyazıt district of Ağrı province of eastern Turkey. 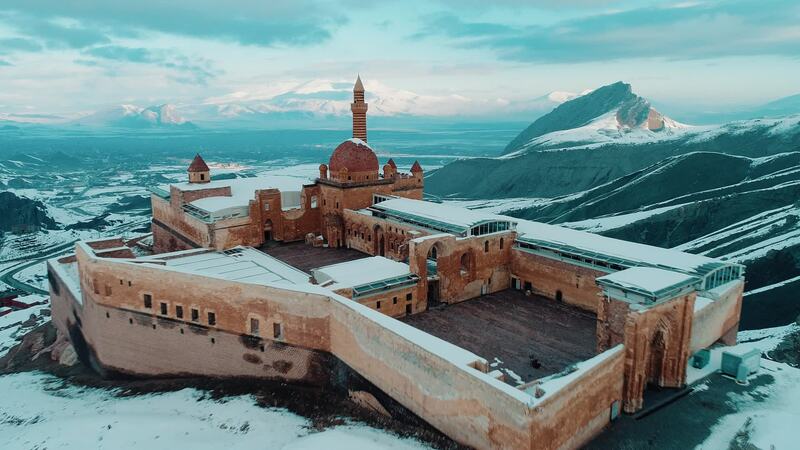 The Ishak Pasha palace is an Ottoman-period palace whose construction was started in 1685 by Colak Abdi Pasha of the Cildirogullari, the bey of Beyazit province. Construction was continued by his son İshak Pasha and completed by his grandson Mehmet Pasha. According to the inscription on its door, the Harem Section of the palace was completed by his grandson Ishak (Isaac) Pasha in 1784. And you can see Mount Ararat at bacground. Despite the scholarly consensus that the "mountains of Ararat" of the Book of Genesis (8:4) do not refer specifically to Mt. Ararat, it has been widely accepted in Christianity as the resting place of Noah's Ark.